Meditating upon these aspects, AzhwAr had great urge to reach the dhivyadhESam where such emperumAn is residing. AzhwAr informs about this desire to those caring relatives and friends who are in his close proximity. This scenario is explained as, AzhwAr assuming a feminine mood and desiring to go to his divine consort makara nedunguzhaik kAdhar emperumAn who is residing in thenthiruppErai (thenthiruppEreyil). At that time, her friends and mothers try to stop her saying “this is not proper etiquette [you have to wait for his arrival to accept you]”; she tells them “I cannot avoid going there; either you all take me there or else I will go myself” and mercifully reveals her determination through these pAsurams. Previously, as said in thiruvAimozhi 7.2.4 “itta kAl itta kai” (foot and hand, remained wherever they were placed), parAnguSa nAyaki remained unconscious; her friends were down even before her; her mother alone called out considering her state, but gave up in the end; finally she regained consciousness and started walking. The reason for her regaining consciousness is, she sustained herself by constantly uttering the qualities of periya perumAL such as aSaraNya SaraNyathva (being the refuge for those without a refuge) etc which she seeks and the qualities of his divine form such as beauty etc, and hearing the same from her mother. The qualities are such that they will bring back life in a dead person. After regaining consciousness, being able to think about the suffering of separation, she reached the state of not sustaining without attaining him, and due to not having that desire fulfilled , she became distressed. 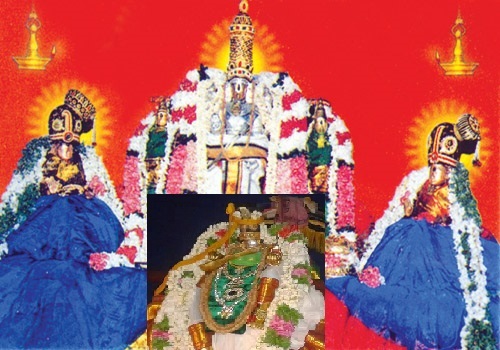 Her heart became captivated by makara nedunguazhaik kAdhan emperumAn who resided in close proximity in thenthiruppEreyil to subdue her anxiety, she decided “I will go to his divine abode”. As before, her friends and mothers surrounded her and said “You should not have so much love; this will lead to disrepute to us”; she replies “there is no use of your advice; my heart is captivated by him; hence, you help me go there to avoid the blame of me leaving without your consent” and informs her determination to them. Alternatively, piLLAn explains it in this manner. As it is said in thiruvAimozhi 7.2.11 “mugilvaNNan adiyE – ivaL aNugi adaindhanaL” (she reached the divine feet of periya perumAL only), as said in SrI rAmAyaNam sundhara kANdam 33.17 “samA dhvAdhaSa thathrAham” (I enjoyed blissfully with SrI rama for twelve years), parAnguSa nAyaki enjoyed overwhelming bliss with periya perumAL for a long time, both their individual identities will perish due to that overwhelming union unless there is a separation in between; as they are now interacting as a single [different] entity due to the union, without the separation their individual identities will be lost; at this time, emperumAn who always looks out for the survival of both the entities, proposes to separate, and as parAnguSa nAyaki does not know about separation [she has such overwhelming experience in union that she has forgotten about previous separation], she thinks “Oh! may be this is one aspect of our enjoyment together” and allows him to separate; emperumAn, leaves citing his going for hunting as the reason and she bids farewell by accompanying him up to the gate – now, the separation will show its real impact certainly; subsequently, she started anguishing; seeing this, her friends and mothers asked her “what are you thinking about?” She said “As the divine daughter of SrI janakarAja accompanied SrI rAma and enjoyed the places where he sat, stood and roamed around, I too desire to be with him where he is”. They said “that does not fit your nature of being a modest wife; your words are invalid”. She said “What is the point in your stopping me? I cannot remain here; it is better if you took me over there”. They said “We won’t agree to do that”. So she said “I will go alone if I have to”. samA dhvAdhaSa thathrAham – I who cannot even get momentary audience of him, enjoyed with him for a long time previously! rAghavasya nivESanE – In the mansion of my father-in-law, as he eliminated all the hurdles, I enjoyed his company for a long time. bhunjAnAmAnushAn bhOgAn sarva kAma samrudhdhinI – I enjoyed all pleasures as said in thaiththirIya upanishath “sarvAn kAmAn” (all pleasures). [Are all qualities fully present in SrI rAmAvathAram?] Here it is unlike that; as said in SrI rAmAyaNam ayOdhyA kANdam 2.26 “bahavO nrupa kalyANa guNA: puthrasya santhithE” (Oh emperor! You son (SrI rAma) has many auspicious qualities), the qualities are doubled here. With this, it is explained that as we cannot withdraw our senses from worldly pleasures, AzhwAr cannot be withdrawn from bhagavath vishayam. Our attachment to worldly pleasures arises from karma; his attachment to bhagavAn arises from his mercy. The words which are seen here as spoken by the mother [of parAnguSa nAyaki] are a special mood/state of AzhwAr; speaking as the divine consort of emperumAn is also a special mood/state of AzhwAr; among these when AzhwAr speaks as the mother who stops her daughter – he emphasises “what if the prAvaNyam (great love towards emperumAn) which is a natural quality of AthmA, becomes the upAyam (means) to attain him?” When he speaks as the daughter – he emphasises “as the upAyam is emperumAn only, isn’t it just natural to have prAvaNyam [great love to reach him immediately]?” Hence in these two different moods, AzhwAr himself reveals these two principles. This decad is great since parAnguSa nAyaki regained her composure and gained the ability to call emperumAn herself. This entry was posted in thiruvAimozhi, thiruvAimozhi 7th centum on August 5, 2018 by Sarathy Thothathri.